A bicycle bell can be the crowning glory of a bike. It’s an important piece of equipment that should be considered carefully before purchasing. I would love to show you the ten best bicycle bells and help you to find the very best one for you. We’ll cover everything from why you need one to all of the unique features of each. Why should you use a bell when riding your bike? The best bike bells will look good and keep you safe. A bell gives you the ability to warn others of your arrival or alert on-coming traffic. It is especially useful if you ride in areas that pedestrians also frequent. A bike bell can even help to distract pets and protect you from dogs or other animals that may approach you while you’re cruising around. 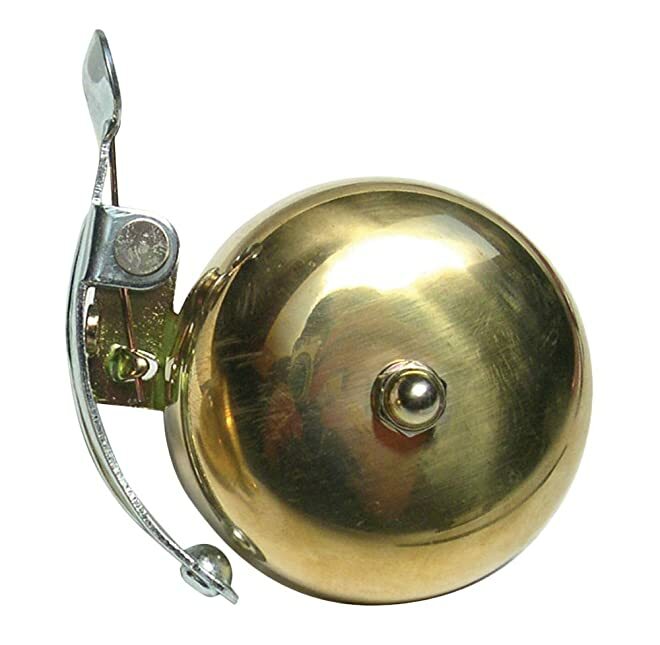 The Origin8 Time Clock Bell is 55mm and made of solid brass. This brass produces a lovely sound that is sure to make you smile when you employ it. It is made in Japan, and all of the mechanical parts are metal to hold up to years of frequent use. + Does this bell fit with any bike? This bell is designed for 22 to 26 millimeter handlebars, but according to users, it can be adapted for larger handlebars if needed. With a larger screw, it can easily accommodate handlebars up to 32 millimeters. Pros: The Origin8 has a beautiful, classic sound that bikers love, and the style and shape look especially attractive on classically styled bikes, such as beach cruisers. It is available in a lovely black or brass finish that holds up well to the elements. This bell is easy on the wallet and loud in sound, which is a great combination for the best bike bells. Cons: A few people found that they had some concerns with this bell. One user reported that the black finish had chipped off during shipping, so you should be careful not to scratch or mishandle this bell. Another found that it took great effort to get the bell to ring. Buy The Origin8 Time Clock at Amazon Now! The Crane Bell Suzue Brass Lever is an excellent bell that is available in copper or an alloy finish. All of the parts of this bell are metal, including the steel-plated clamp and the striker. The design style will remind you of classic bike bells, and it has a spring-loaded lever strike system to produce a truly lovely sound. This bell was created for bikes with handlebars that are 22 to 26 millimeters in size, and it is 5.5 millimeters in diameter. It can even be mounted on either side of the handlebars, so you can easily reach it with whichever hand feels more comfortable. Pros: Crane has a great reputation with bike bells, and this model is no exception. This bell will look impressive on your handlebars, and you’ll be impressed by the loud, melodic sound it makes. It is very effective at alerting pedestrians of your arrival, which is exactly why you need a bell. Cons: The striker on this bell is fairly stiff, so you have to ensure that you use it properly to produce the sound. Please be aware that it may not fit every handlebar well. 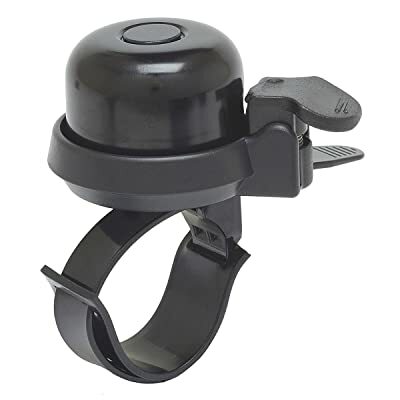 If you have dropped handlebars, it may be difficult to attach this bell to a location on your handlebars that you can reach easily. Buy The Crane Suzue Brass Lever at Amazon Now! 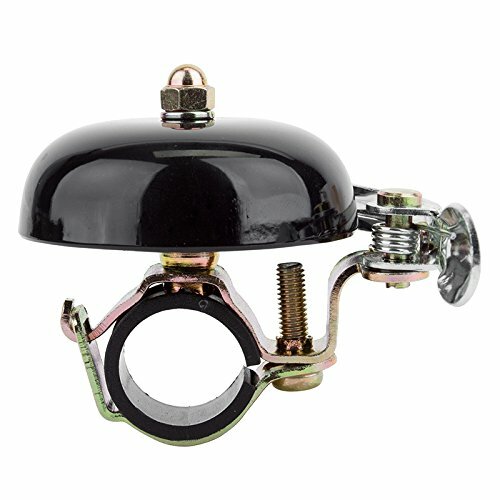 The Mirrycle Incredibell Original Bicycle Bell is made of a lightweight alloy that will not rust or change in sound through the years. It’s available in black, brass, or silver, and its small size conceals a powerful sound. This basic bell is also a budget-friendly choice. This bell is designed to fit 21.7 to 26 millimeter handlebars, and it adjusts to the majority of bicycle handlebars, including children’s bikes. It is easy to install or remove simply with a screwdriver. Pros: This bell projects a loud, clear sound that will get people out of your way, and it comes in a tidy, little package. It is easy to install on the vast majority of bikes, and it is also easy to operate with a flick of your thumb. In addition to that, most people found that it only works when you operate it, so it’s nice to have a bell that does not rattle or sound by itself while you’re riding around. Cons: Be careful if you use this bell in the rain, for the mechanism can get rusty that way. Some bikers also found that the mounting screw was easily stripped, so please be cautious during installation or removal. Buy The Mirrycle Incredibell Original at Amazon Now! The Mirrycle Incredibell Brass Duet Bicycle Bell is available in eight different colors to give you exactly the right splash of style that you need. You can purchase it in black, blue, brass, chrome-plated, green, orange, pink, or purple with caps. It has a solid, brass dome, and it was designed with a trigger-pull lever that produces a nice sound. It was crafted to fit most handlebars that are 21.7 to 26 millimeters. The clamp is 25.4 millimeters in size, and the dome has a diameter of 33 millimeters. Pros: This bell rings with a classic sound that usually resonates twice when employed. Many people reported that it was loud enough to be heard by pedestrians. This bell even operates well with a clear sound in inclement weather, so you can use it no matter what mother nature has in mind for the day. Cons: While technically this bell attaches on most handlebars, some users felt like it was a tight fit on their handlebars. Also, some people may find this bell easier to operate with the left hand than the right, which is an unusual feature for a bike bell. Buy The Mirrycle Incredibell Brass Duet at Amazon Now! The Bicycle Hamburger Bell by Lexco is a fun and whimsical way to let people know that you’re approaching. 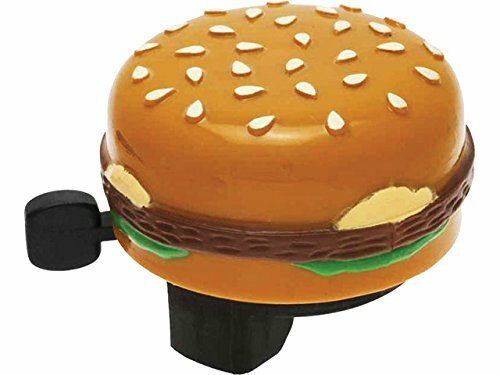 Shaped like a classic hamburger, this little bell is less than 2.5 inches in size, and it will make you smile whenever you look down while riding. The sturdy, plastic exterior can hold up to frequent use. This bell may fit better on a child’s bike than on an adult’s model, but many grown-up bikers were still able to install and enjoy this fun bell. In light of that, you may be able to purchase a larger screw to attach it with if your bike has wide handlebars. It is easy to install for hours of enjoyment and use. Pros: This bell is adorable and sure to draw attention wherever it goes. It is loud enough to alert people that you are coming and cute enough to get noticed. Kids of any age find that it’s easy to use. Cons: You may notice that this bell makes a little noise by itself when you traverse bumpy terrain. Second, this bell works best when installed on the right handlebar, so please keep that in mind. Also, there are some plastic components to this bell, so it may not withstand a collision intact. Buy The Lexco Hamburger Bell at Amazon Now! The Mirrycle Incredibell Jellibell Bicycle Bell is a beautiful bell that will add a unique touch of style to your bike. The frame of this bell is translucent, which allows you watch the action when you use it, and it’s available in blue, green, hot pink, orange, purple, and strawberry. It’s designed to be rain-proof for a great sound in any weather. 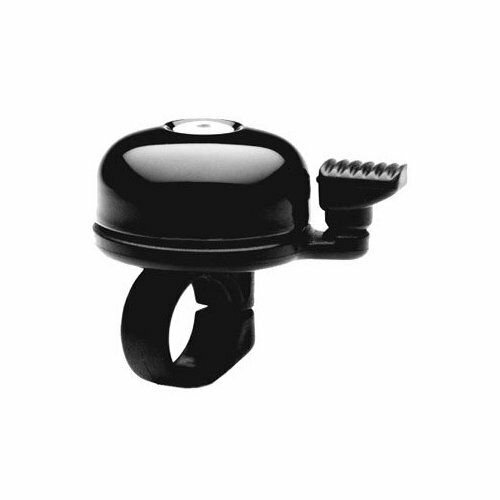 This bell fits best on bikes with handlebars that are 21 to 22.5 millimeters. The dome is just under two inches in diameter. Pros: This bell is especially great for a child’s bike because of the fun colors and ease of use. Mirrycle has recordings of the bell’s sound on their website, so you can “test” it out before purchasing. It’s also easy to install and stays in place well, which are also great features for a child’s bike. Cons: All of the components of this bell are made of plastic, so it may be less durable than a metal bell. It is loud enough for children to use while playing, but this bell may not be adequate for adults in a busy area. Buy The Mirrycle Incredibell Jellibell at Amazon Now! 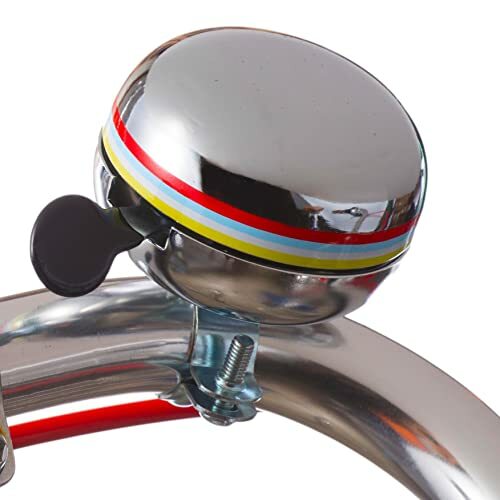 The Firmstrong Classic Beach Cruiser Bicycle Bell is a stylish bell that comes in a wide variety of colors. It is available in baby blue, black, chrome, pink, vanilla, and white to offer you just the right look for your bike. It creates a classic bell sound, and it is loud enough to alert pedestrians of your arrival. This bell fits well on most handlebars, and it’s designed for the bikes of children or adults. It attaches easily with two screws, so you can install it or remove it like a pro in mere seconds. Pros: This bell is easy to operate and gives off a great sound. It coordinates particularly well with Firmstrong cruiser bikes as it uses the same paint colors and finishes. 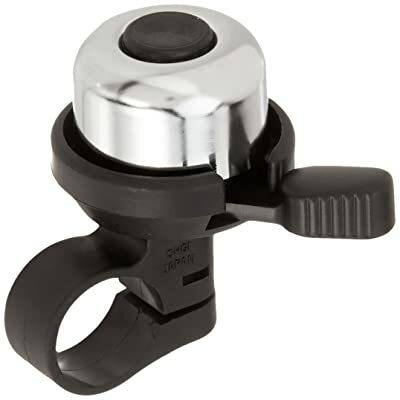 It will do exactly what you need a great bike bell to do, and it’s constructed with metal parts for increased durability. Cons: Some users found that this bell rattled over bumpy paths causing the bell to ding unintentionally. Also, occasionally the photographs of this bell do not adequately convey the true color of the product. Buy The Firmstrong Classic Beach Cruiser at Amazon Now! 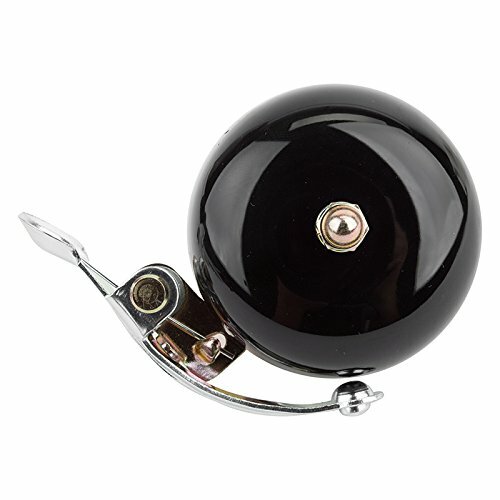 The Bell Sports 7015983 Dinger200 Chrome Bike Bell has several unique features for an inexpensive price. It is equipped with a rubber shim to give you a custom fit and to decrease the risk of scratching your bike. The chrome-plated finish is shiny and weather resistant. This bell was created to fit on most handlebars. This little noise-maker is two inches in diameter and looks great on most bikes. Pros: The Dinger200 will remind you fondly of the bike bells of your childhood. 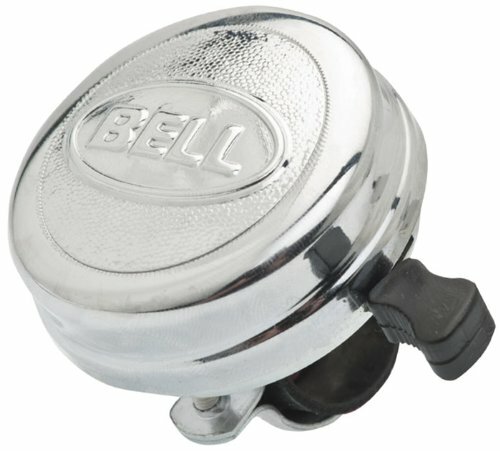 Bell Sports has recreated that classic bike bell sound with a great product that has been improved for today. The long sound comes from a weather-resistant package that is sure to hold up to the elements. Cons: A few bikers found some areas of concern with this bell. There is the possibility that the chrome finish will reflect sunlight and irritate your eyes if you’re not wearing sunglasses. While most people felt that the bell remained securely on the handlebars, one found that it had the tendency to slide around and needed to be adjusted frequently. Buy The Bell Sports 7015983 Dinger200 at Amazon Now! The Mirrycle Incredibell Adjustabell 2 Bike Bell is ready for action wherever you need to place it. It is truly an adjustable bell that can be used with anything from a bicycle to ski poles, so it will help you to beat the rush in any place. The lever of the bell can be rotated around the dome, which lets you use it with any finger or either thumb with ease. It is available in silver or black. This bell should accommodate any bike. The attachment strap fits equipment or handlebars that are 15 to 39 millimeters in size. Pros: This bell is perfect for bikes with unusual handlebar sizes as it truly can fit almost any size of handlebars. The sound is loud and clear to alert oncoming traffic without scaring anyone. It even functions well while wet from rain. Cons: Please be aware that the locking mechanism on the attachment strap performs best when used the first time. If you plan to remove the bell frequently from your handlebars, then this may not be the best one for you. Additionally, the striker is on the outside, and it is the motion of your finger that allows it to create a sound. You may have a problem getting an appropriate sound if you do not strike it correctly. 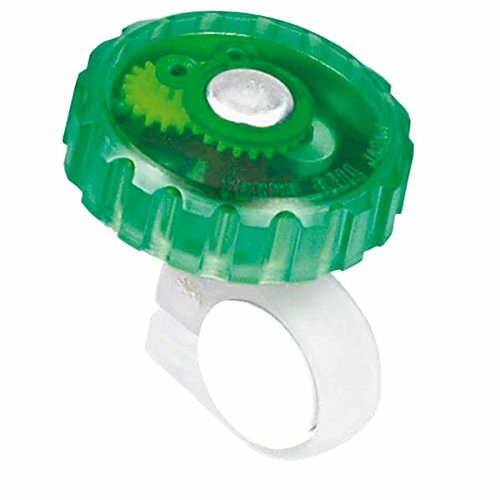 Buy The Mirrycle Incredibell Adjustabell 2 at Amazon Now! The PUBLIC Bikes Bike Bell is an adorable bell that color-coordinates perfectly with PUBLIC bikes. Each one has a pretty accent strip, and it is available in black, chrome, cream, green, mint, powder blue, and red. It’s cute and loud, so it will get you noticed by people everywhere. This bell has the PUBLIC brand of bikes in mind and fits them best. It attaches to the handlebars with a chrome-plated base and a handlebar clamp. Pros: This retro bell will add some chic and sound to your bike. The tone is clear and strong, and it’s durable enough to add to a child’s bike. It is easy to mount and stays securely in place throughout your travels. Cons: This bell works best as a left-handed bell, so please consider that when you purchase it. Also, you may wish to apply some lubricant to the lever mechanism to make it easier to use; several bikers reported that it is stiff initially and could even result in a broken fingernail. Buy The PUBLIC Bikes Bike Bell at Amazon Now! While each of these ten best bicycle bells have something unique to offer, my personal favorite is the Origin8 Time Clock Bell. Its classic look complements almost any style of bike, and the sound is clear and sweet. With exclusively metal parts, it offers you years of use, and it’s easy to install to start enjoying right away. Whether you live in a crowded urban area or a neighborhood with lots of animals, a bike bell will let people and pets know that you’re coming. It can be a key component to your safety while biking, and at the same time, it can add a touch of personality to your handlebars. The perfect bike bell is loud enough to be heard and pretty enough to be seen.